According to a Bad Ad Program 2010-2011 Year End Report just issued by the FDA (see here), the program is a success despite the fact that ONLY 125 complaints were deemed worthy of "comprehensive review." The remaining 203 Bad Ad complaints were presumably filed away in DDMAC's circular file. Those 125 complaints worthy enough for review lead to 5 enforcement actions. The agency "does not view the total number of reports, or number of enforcement actions taken as the primary measures for program success," said FDA in the report. "Instead, FDA’s most important measure of success for this program is the heightened sense of awareness of misleading promotion among HCPs throughout the health care community and the likely useful deterrent this awareness has on drug promoters who might run afoul of regulation absent of such messaging." 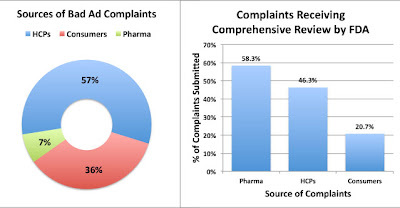 FDA received complaints from three sources: Healthcare Professionals (HCPs), Consumers, and "representatives of regulated industry" (ie, pharma companies ratting out their competitors). 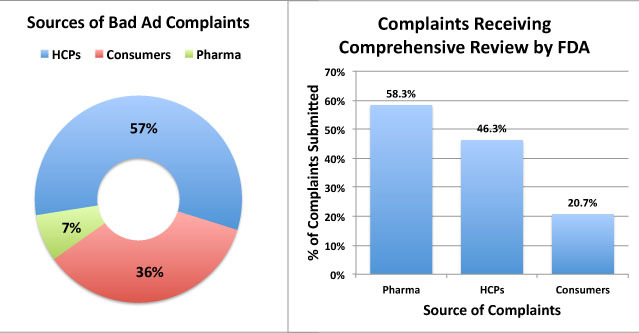 The "pharma" group of complaints was the most credible -- 58% of those complaints were deemed worthy for "comprehensive review," whereas 46% of HCP complaints and only 21% of consumer complaints made the cut (see chart below; click for enlarged view). FDA says that the quality of complaints submitted by HCPs "demonstrates a relatively strong level of knowledge in the medical community about what constitutes misleading promotion." Since pharma's complaints were even MORE credible than those from HCPs, FDA should have said it "demonstrates a relatively strong level of knowledge in the PHARMA community about what constitutes misleading promotion." It's not clear, however, if "representatives of regulated industry" include HCPs employed by pharma companies. At least one recipient of an FDA Bad Ad enforcement letter claimed the complaint came from such as source (see "Competitors Are "Best Source" of Complaints About Promotions Received by FDA").